Khartoum (Agenzia Fides) – Very tense situation in Khartoum, where for weeks demonstrations have followed to demand the resignation of President Omer Hassan al-Bashir, in power for 30 years. 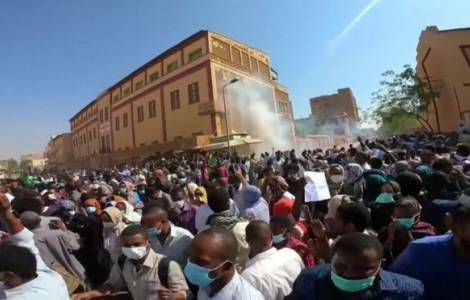 Thousands of protesters gathered in front of the army headquarters, where the police and security service, the National Intelligence and Security Services (NISS), are trying to disperse them. But several soldiers intervened to protect the demonstrators, firing warning shots to ward off policemen and security men. Apparently the clashes have caused deaths and injuries. Fides sources say that it is difficult to gather information on the spot also because the representatives of the international community prefer to stay at home for security reasons. The demonstration in front of the Army Headquarters is the most impressive since the protests began on December 19 last year. The sit-in started on April 6th. The police charged the demonstrators with the use of tear gas but thousands of demonstrators remained on the scene. The first protests erupted when the government decided to increase the price of bread. From an economic demand it then moved on to a political one, asking for the resignation of the President who has guided Sudan since 1989 when he took power with a military coup. The Sudanese protest movement has gained new momentum after Algerian President Abdelaziz Bouteflika resigned after millions of Algerians took to the streets for weeks. According to the authorities, since the protest began there have been 32 deaths, 51 according to Human Rights Watch (HRW).